This is about upliftment the society and set an example of a social system. Recently china was having huge traffic issues due to the huge amount of the population. But when it comes to china they are always prepared for almost every disaster. And for the traffic issue,’s they had a better idea than subways etc. 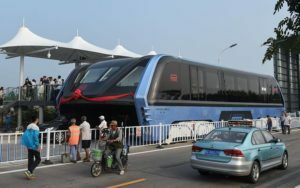 Recently china introduced a Trans Elevated Bus to the world when they finally developed in in just 3 months. And also it has been tested around like for few 100 meters. And guess what, The first experience was amazing and successful. 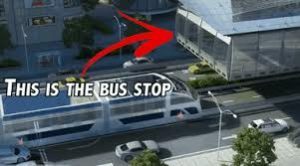 This is how it works, The bus would literally move over the car’s and travel around without any incidents or jams. 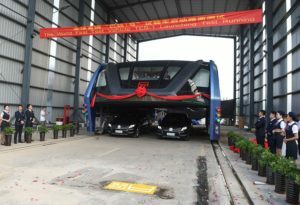 Now watch the below picture of the first ever launch of the Trans Elevated bus. It looks cool and everyone is really excited for this thing. This train has a good amount of seat’s in it and this idea was introduced back in 90’s but they implemented it now. 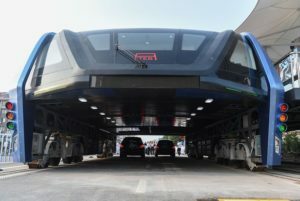 The train can carry over 1200 passengers in it and without any worries, two rows space available for the cars to pass through them leaving a 2 meters height in which cars can pass. Now in the below image you can see the bus stop.